Did you know, sweet chariots were originally pulled by bunnies? Have you gathered that behind the scenes at Bunny HQ we have a very strong male presence in our lives? There are The Brothers Smith x 2 who run the business.The little Ratbags x 4 who inspire and drain the business in equal measures.The Cyborg x 1 who simply inspires dailyplus the two luckies we married consisting ofHe Who Shall Not Be Named (a Harry Potter addict)andHe Who Always Gets Way More Sleep.Which means that as well as the biscuit and cake worshipping sessions, the marathon training and the designing we also know/have absorbed a thing or two about sport. And it turns out we might just be a little bit fond of some healthy competition ourselves and we might just spend a lot of our time enjoying cold feet and bacon sarnies on a Sideline Sundayand we might have a sport that we love, really love, right here at Bunny HQ. 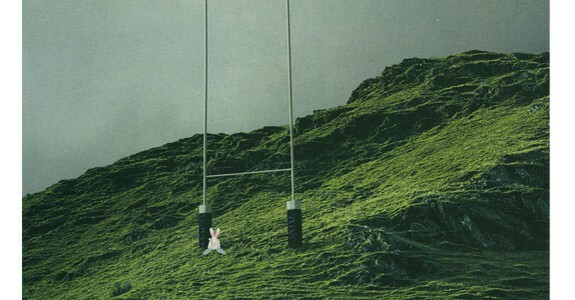 It’s time to man things up a little (in a fluffy bunny kinda way) and go all out for a bit of Six Nations action. To indulge our passion for rugby, we thought we’d have a little bit of fun and share the Six Nations with you and give Rufus the chance to showcase his rugged side. Here’s how to join in Rufus’ Sweet Chariot Challenge. Simply predict the final score total on the chosen game and walk away with pride, a limited edition Rufus bunny, a team’s flag and a mini six nations rugby ball, perfect for training up tomorrow’s stars. A quick guide on how to play. 1. We’ll choose the rugby game and ask you to predict the total score of that game. (Asking your significant other to suggest is perfectly acceptable)So, if you think the score will be 15-15 in the England vs Scotland Game, the number you need to predict is 30. 2. You pop your score prediction against the Sweet Chariot rugby photo of Rufus on Facebook, lines stay open up until 5 minutes BEFORE kick off. eg on Saturday 1stMarch, your prediction will need to be posted by 4.55pm. 3. Once the final whistle has been blown, we will pick the number closest to the final score and that person is A WINNER!!!! ** WOOO HOOOO. 4. We’ll announce the winner on Facebook and then you will just need to inbox us your details. 5. Easy peasy lemon squeezy, a limited edition Rufus and all he can carry could be yours. **If there is more than one winning number, names will be put into the Rufus kit bag and drawn out at random.